2016 Lexus RX - pricing, pictures and specification | What Car? The new fourth-generation Lexus RX SUV will cost from £39,995 when it goes on sale at the start of next year. This fourth-generation of the Lexus RX is longer, wider and taller than the outgoing car and has a longer wheelbase - something Lexus says will mean more interior space and extra comfort inside. Most noticeable about its styling is its large spindle grille. As well as being a design hallmark for Lexus, that grille also appears on the firm's smaller SUV, the NX. The RX sits on 20-inch alloy wheels. The car’s current hybrid powertrain will be retuned, and will feature a 3.5-litre V6 engine mated to an electric motor. Total output from the system will be around 300bhp. Lexus says both powertrain options have been tuned to return high fuel economy and low CO2 emissions. All RX models apart from the entry-level petrol are all-wheel drive. The entry-level S model comes with dual-zone climate control, heated front seats, satellite navigation with an eight-inch screen, DAB digital radio, reversing camera and LED headlights. Step up to the SE, which is the lowest trim available with the hybrid powertrain, and you get auto-dimming mirrors, leather upholstery, heated and cooled front powered seats, ad memory settings for the seat, mirrors and steering wheel positions. Luxury versions add a larger, 12.3in satellite navigation screen with DVD player, 20in alloys, a gesture controlled bootlid and a wireless phone charger. Higher-spec F-Sport versions also get visual upgrades, including a new mesh for the grille and front bumper, with unique alloy wheel designs and a different instrument cluster. The car also gets steering wheel-mounted paddles. The F-Sport also gets a new active stabiliser system, which helps to keep the car level through corners, as well as adaptive variable suspension. Drivers can select from a new Sport S+ mode, too. The range-topping Premier model adds more kit like a colour head-up display, an upgraded 15-speaker stereo system, heated steering wheel and the choice of a sunroof or a panoramic glass roof. 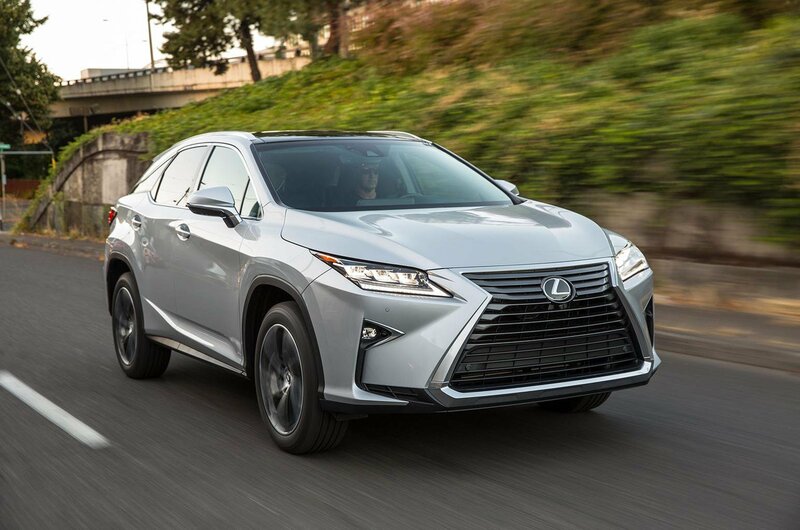 Other new features on the RX include Lexus’s Safety System+, which combines existing technologies such as pre-emergency braking, lane departure warning and automatic high-beam lights. The system also includes a new lane-keeping assistance feature, and also works with the car’s adaptive cruise control. Optional safety features include adaptive lighting, a panoramic view camera system and a blind-spot monitoring system. Pricing will start at £39,995 for the S trim version of the RX 200t, while the RX 450h starts at £46,995. This brings the SE trim, while pricing goes up to £57,995 for the 450h Premier. Key rivals for the Lexus RX are the Range Rover Sport, BMW X5 and Mercedes-Benz GLE. We've yet to test the GLE, because it has only just been unveiled in New York, but the BMW X5 currently holds a four-star rating on What Car? while the Range Rover Sport gets the full five stars.